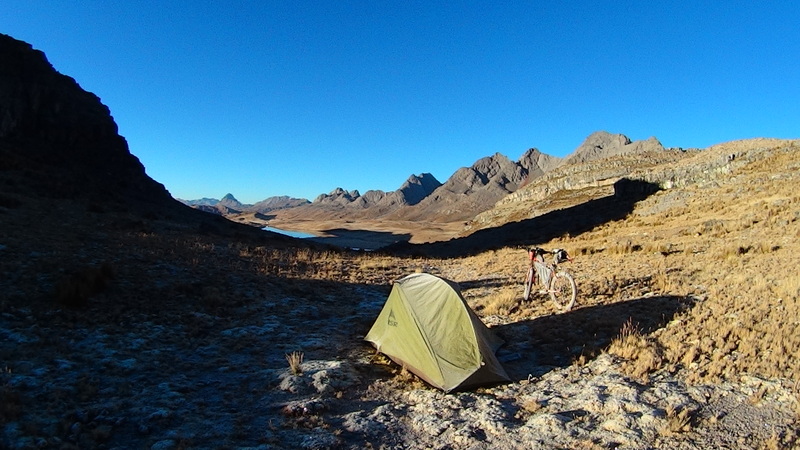 Huaraz is a great place to rest and restock. However it has a problem. 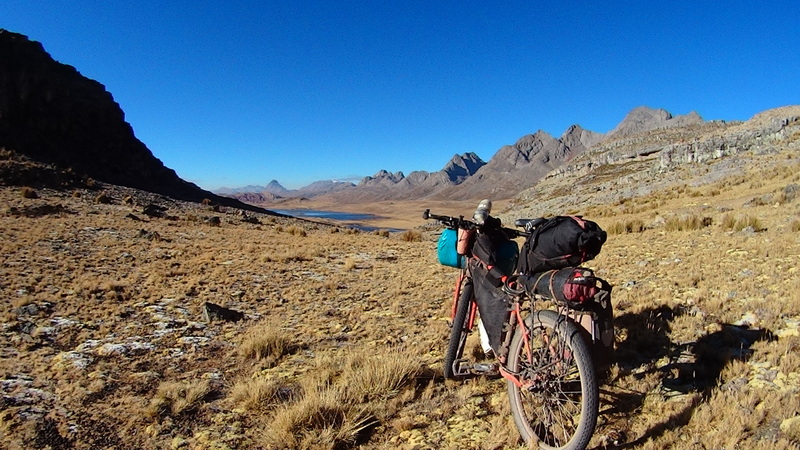 It is right by the monumentally distracting Cordilleras Blanca and Huayhuash. A short planned stay of a few days can easily turn into a few weeks. Throw in an inconvenient bout of suspected pneumonia (self-diagnosed) and of course the standard tedious upset tummy and suddenly you’re staring at your calendar in disbelief wondering where one and a half months just went. 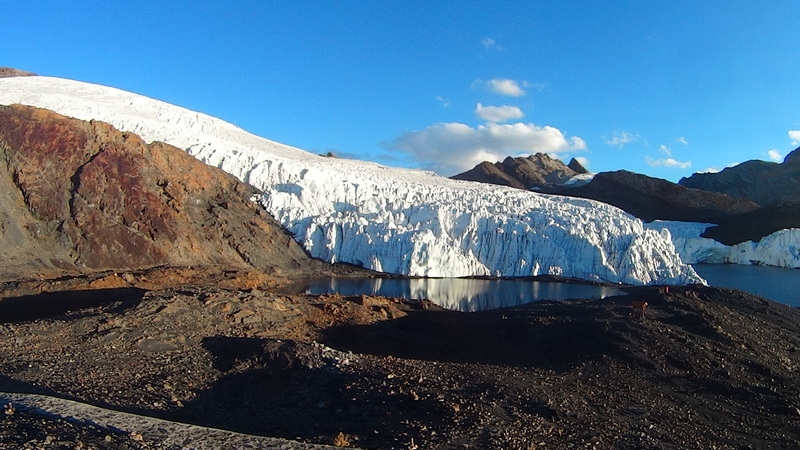 Pastoruri glacier: of particular concern is the clear demarcation of its frighteningly rapid recession; hundreds of metres over the last thirty years. The 80’s are long gone; allegedly its slopes once held the highest ski and snowboard competitions in the world. My immense loss of fitness became almost immediately apparent as I ‘cough’ cycled my way over the first pass via the touristy Pastoruri glacier (5000m). Even after the endless glaciers of Cordilleras Blanca and Huayhuash, the extra 200m climb up to the Pastoruri glacier was worthwhile. With an hour of daylight left there was no one and it was easy to find shelter in the walkway of the closed tourist shopping area. Several passes and another hideous Peruvian mine later, I found myself at Oyon. In desperate need of rest from 5 long consecutive riding days I was fairly disappointed to have a million drunk Peruvian eyes bearing into me as I entered the town square. I had arrived during the yearly football tournament. Irritable and h-angry it took all my stoic discipline to not axe someone to death as the inevitable questions and unwanted attention arose. To maintain my sanity and soothe my irrational emotional state I escaped from the mayhem into a more expensive than usual hotel (50 soles) that had a window onto the football field. In my delirious state I had been unable to easily find a cheaper and acceptable alternative (although they exist). 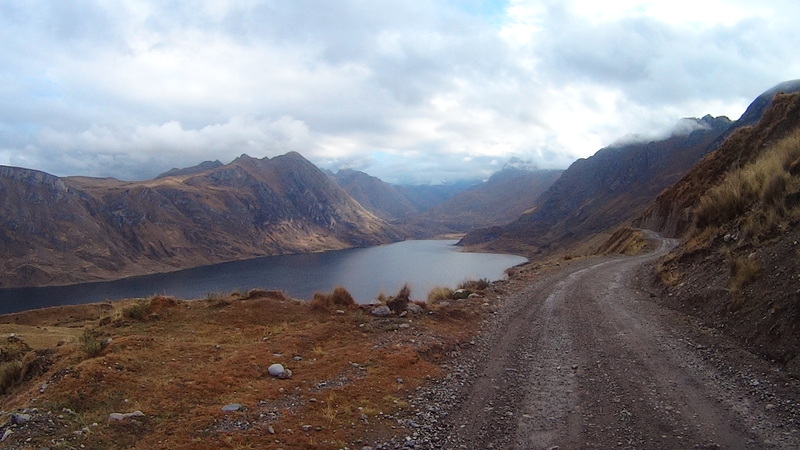 Above: my 10 day route (one rest day) from Huaraz to Chosica, click ‘View Full Route’ and then ‘Export’ tab for the gpx. I had missed the first part of the famous Pike’s route from Conococha so that I could check out Pastoruri glacier but also I wanted to avoid a practically unbroken ascent with an elevation gain of 3500 metres. I was able to re-join in Oyon and the enormous one to two thousand metre climbs continued through the staggering landscapes. Using a bike pump as a bike stand. Who knew?? (Combined with a front hand brake made from a discarded inner tube.) 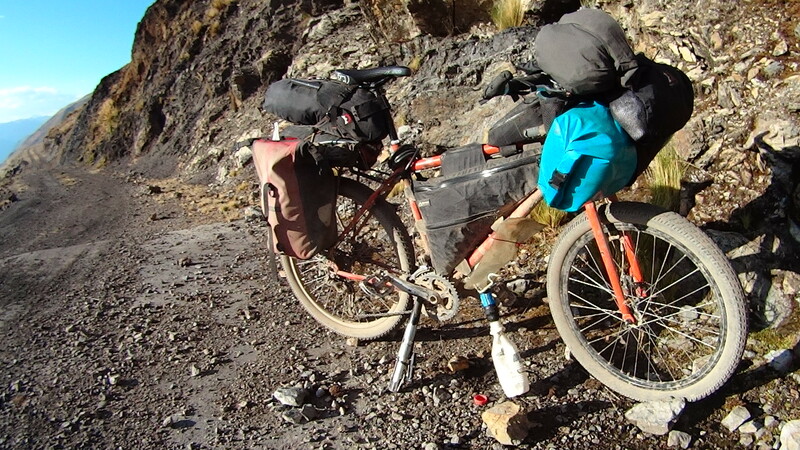 Here stopping for water partway up a 2000m climb. Scott kindly gave me his water filter; here I have secured it within my bottle cage to avoid the need to laboriously hold it for 5 minutes whilst it drips out. ‘My’ new bike pump stand innovation is particular useful in this situation. 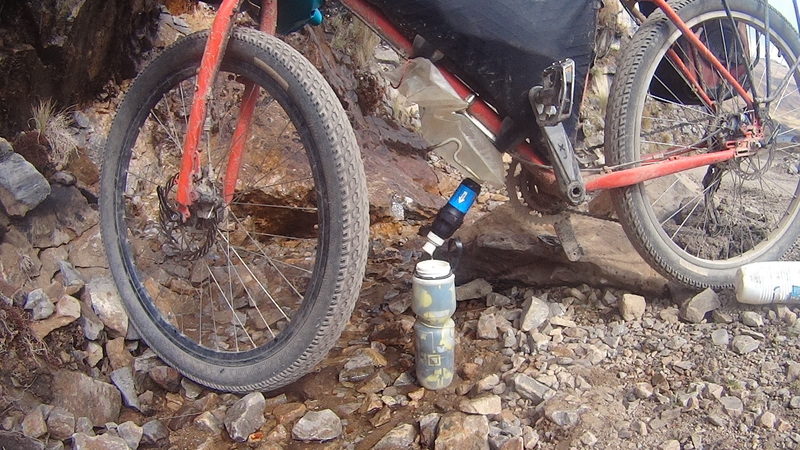 This water filter means that carrying only one bottle of water is sufficient where streams are plentiful (a lot of the Andes); obviously a desert is a different matter. 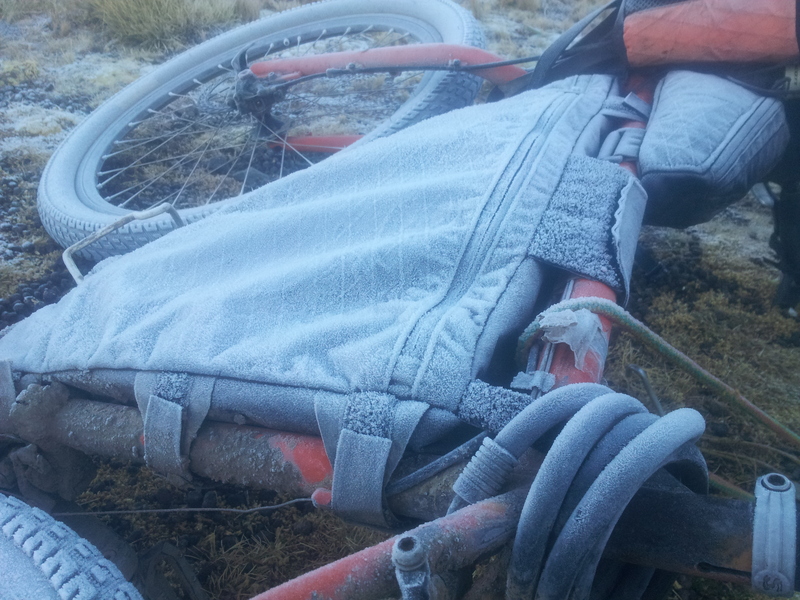 Confirmed: camping at a 4800metre is cold. Later I was told there are jaguars up here which I find hard to believe. The descent to Chosica. 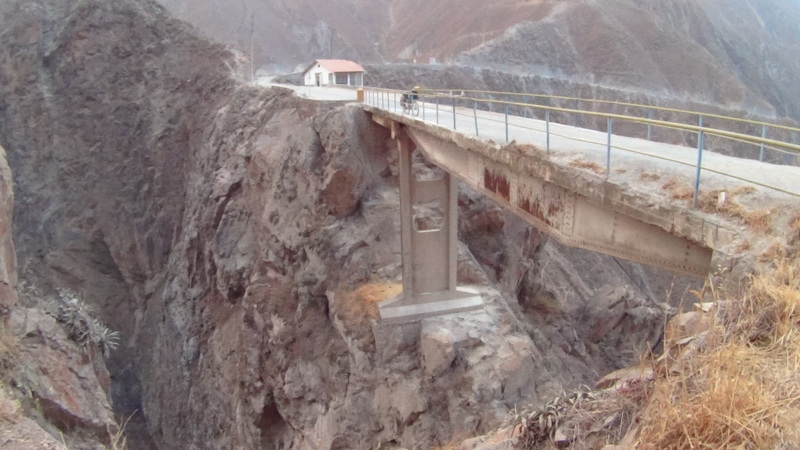 This particular bridge is high enough for ‘puenting’ – throwing yourself off with a rope attached. 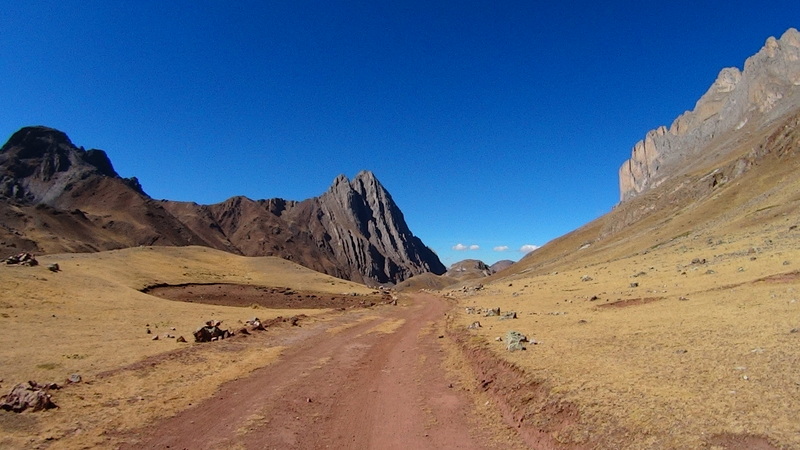 Numerous passes and a couple of obligatory mines later, I took the 4000 metre elevation drop and 80 kilometre unbroken descent down the dirt road to Chosica via Milloc and Huinco. I had some chores to take care of in Lima. Free of traffic (unlike the paved and heavily transited Carretera Central) this descent was hugely exhilarating and took around six or seven hours. It partly passes through a huge canyon with a death road style drop off. After such a long period at altitude, I received a fantastic sensation of well being due to the sudden increase in oxygen levels. Combine that with the dramatic changes in climate and scenery this was an intense ride for my senses. IT. FELT. GOOD. Note: About halfway down there is a turn off which heads up to San Pedro de Casta which then re-joins the main ‘valley’ road further below (crossing the bridge featured above I believe). It involves climbing a few hundred metres but judging by the view from below it most definitely would be worth it. There are a couple of different tourist attractions such as the Marcahuasi ‘bosque de las piedras’. Had I known, I would have taken it. 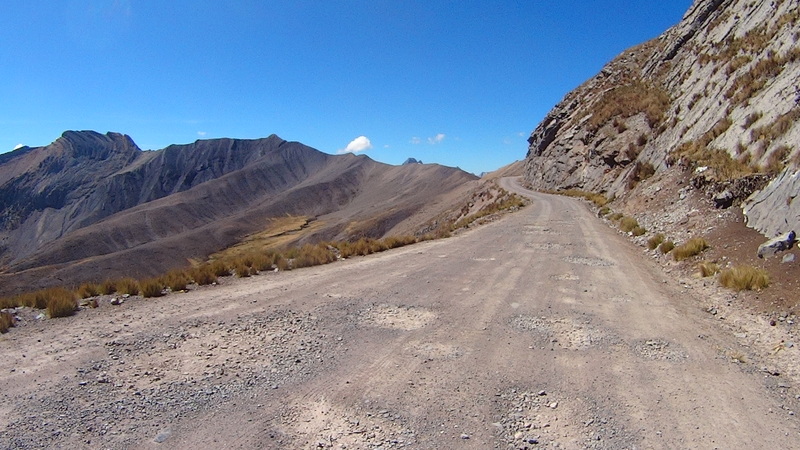 Getting back up to the mountains: Even if you did’t need to go to Lima and were to catch the bus straight back up to San Mateo and then combi to Rio Blanco to continue on the Pike’s route I consider this descent worth doing. It looks like there is a rideable / less traffic dirt road route via Chocachacra and Tuna that would probably take about three days to get back up where you can re-join the Pike’s route; I may have done this with more time. The bus from Chosica to San Mateo cost me 24 Soles (since I took up 4 seats of 6 soles each) but if you manage to find a bus with a roof rack I assume they’d charge only 6 soles (they seemed to leave first thing in the morning at 5.30 and 6.30 but this could vary). The combi to Rio Blanco was another 12 soles. Getting to Lima: From Chosica to Lima the traffic is fast and unpleasant so I left my bicycle in Chosica and took the fast colectivo to Lima ($10 soles). You get dropped at San Isidro and then it’s a short bus to Miraflores (1.20 sol) on the ‘corredor azul’. In Lima I stayed at ‘Friends House’ hostel, Miraflores which was a good option in this expensive city. 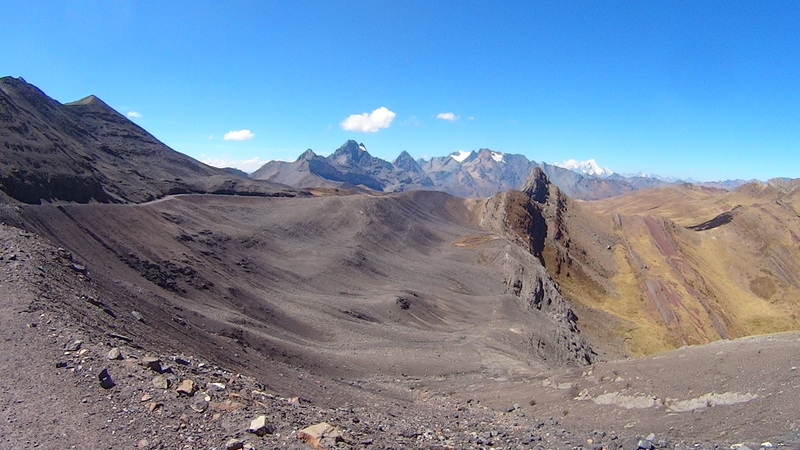 ← Cordillera Huayhuash – The 3rd Circuit – World’s Best Hike? Sounds like a much better option for descending to Chosica than the mental Carretera Central, which I took!